Double-orifice tricuspid valve (DOTV) is a very rare congenital cardiac anomaly. Most cases are diagnosed incidentally during open heart surgery or autopsy. Different surgical approaches are adopted to deal with this anomaly. We report an unusual case in which one of two orifices of the tricuspid valve was entirely committed to the left ventricle. This was identified preoperatively and corrected through a unique surgical approach. A 12-year-old girl presented with palpitation of recent onset. She was previously identified to have a restrictive perimembranous ventricular septal defect (VSD) (restricted by the septal tricuspid leaflet) during infancy. She remained asymptomatic throughout childhood and presented 12 years later with a history of palpitation of one-month duration. On examination, there was left parasternal heave with epigastric pulsations, a wide variably split second heart sound and a pansystolic murmur at the left lower sternal border. There was no cyanosis. The electrocardiogram showed ectopic atrial rhythm with low atrial focus and incomplete right bundle branch block. 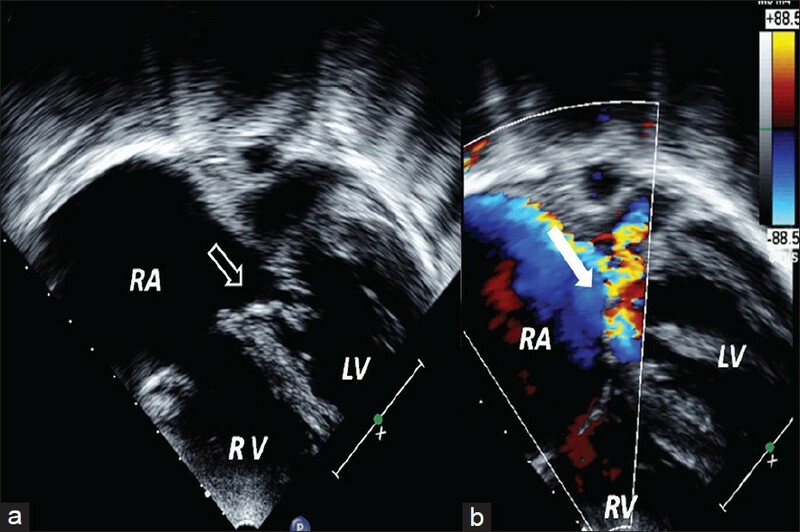 Transthoracic echocardiography showed dilated right atrium (RA) and right ventricle (RV). An accessory opening of the tricuspid valve (TV) into the left ventricle (LV) was found to be situated in the posterior plane with a separate tensor apparatus [Figure 1]a and b. The atrioventricular junction was overriding the ventricular septum. A large LV-to-RA shunt was noticed through the regurgitant accessory tricuspid orifice during systole. There was unobstructed flow from RA to LV during diastole. The other orifice (RA to RV) was unobstructed and competent. No VSD was seen. Surgical findings showed two tricuspid valves. The additional valve orifice with separate tensor apparatus with ruptured chordae was situated posterior and inferior to the normal valve orifice [Figure 2]a and b. On testing with saline, an LV-to-RA shunt was found. 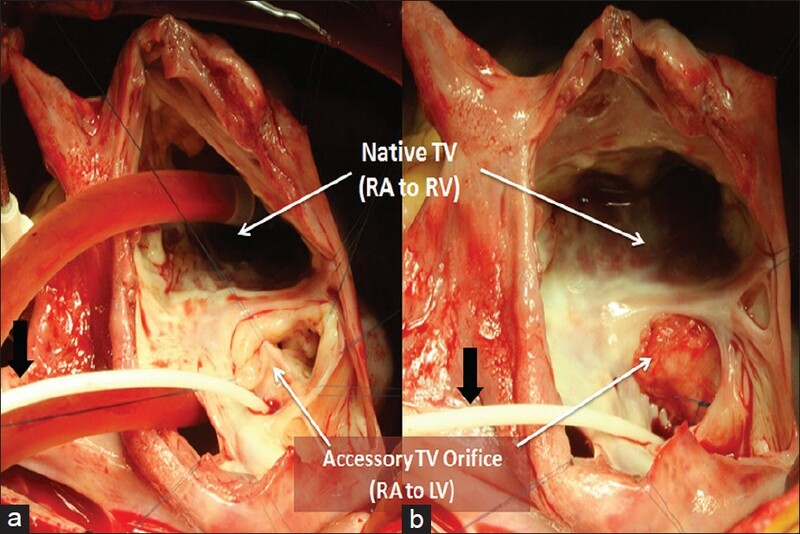 Under cardiopulmonary bypass through RA, the abnormal TV leaflets were sutured together and the additional orifice was further closed with a tanned pericardial patch, sutured along the annulus, safeguarding the conduction tissue. There was no residual shunt on postoperative echocardiography. In comparison to double-outlet mitral valve, DOTV is rare and is usually associated with other congenital anomalies, most commonly with septal defects (45%), malformations of the mitral valve, Ebstein anomaly, and tetralogy of Fallot. ,, Isolated DOTV is extremely rare. To the best of our knowledge, of 42 reported cases in the literature, only six were isolated. Most of these cases were diagnosed incidentally during surgery (55%) or autopsy. Only two reported cases were diagnosed through preoperative echocardiography. , In our case, the child was diagnosed as a case of restrictive perimembranous VSD in infancy. Follow-up echocardiography done at four years of age showed that the defect was closed by septal TV tissue and there was no residual shunt. Finding of the accessory TV orifice was missed initially. The intraoperative finding showed ruptured chordae, which was responsible for the incompetence of the valve and LV-to-RA shunt resulting in dilated RA and RV. Based on the location of the defect, Duplication of AV valves was classified first by Hartmann in 1937 and this classification was revised by Sanchez et al. into three types: (1) Commissural type (Hartmann's type L) in which the accessory orifice is at the end of a valve commissure and its subvalvar apparatus is the normal one for that commissure, though sometimes accessory papillary muscles maybe present; (2) central type (Hartmann's types B and S) where a fibrous band divides the atrioventricular orifice into either equal or unequal parts as was seen in our case; (3) hole type, in which the accessory orifice is a hole in a cusp. This form of double-valve orifice is to be distinguished from a simple fenestration or cleft which has no subvalvar apparatus. It is essential for the identification of the duplication of a valve that both orifices should be provided with a subvalvar apparatus, though this maybe rudimentary for one of them. Repair of the DOTV is most commonly done as part of cardiac repair for other major defects, rarely because of stenosis or significant regurgitation. In our case, the VSD got closed spontaneously, and severe regurgitation of the accessory TV orifice and LV-to-RA shunt warranted repair. In previous reported cases, the accessory tricuspid orifice was left unrepaired in 25%, surgical management was not specified in 55%, and annuloplasty and suture repair were done in 10% each. , As there is a high-pressure gradient across the accessory valve (LV to RA), in addition to the suture closure of the accessory valve, the pericardial patch acts as a secondary barrier preventing late dehiscence of the suture-closed valve leaflets. To the best of our knowledge, this is the first case treated with this unique surgical approach. 1. Zhang J, Ma WG, Pan SW. Surgical management of Double-Orifice tricuspid valve. J Card Surg 2011;26:425-8. 2. Tutarel O, Westhoff-Bleck M. The double orifice tricuspid valve: A review. J Heart Valve Dis 2007;16:508-10. 3. Anil SR, Rao SG, Kumar RK. Duplication of the tension apparatus of the Tricuspid valve. Cardiol Young 2003;13:106-8. 4. Wang BX, Yin BL, Pan YZ, Yin N, Chen C, He B. The clinical experience of Double Orifice tricuspid valve. Heart Lung Circ 2013;22:229-30. 5. Sanchez Carlos A, Rabago P, Sokolowski M. Duplication of the tricuspid valve. Br Heart J 1967;29:943-6. 3 result 1 Document How best to explain unexpected arrangements of the atrioventricular valves? Authors of Document Anderson, R.H.
4 What are double-outlet left atrium and double-outlet right atrium?